TAMPA: The way some irrigated rice paddies are managed worldwide, with cycles of flooding followed by dry periods, may lead to twice the planet-warming greenhouse gas pollution as previously thought, researchers said Monday. Since rice is a major staple for at least half the world’s seven billion people, the way it is managed has significant effects on the Earth’s warming climate, said the report in the Proceedings of the National Academy of Sciences, a peer-reviewed US journal. For the study, researchers at the non-profit Environmental Defense Fund took a closer look at emissions of nitrous oxide, a long-lasting atmospheric pollutant that is more potent than methane or carbon dioxide. N2O rises when rice fields are allowed to dry before being wetted again. This process, called intermittent flooding, happens when water falls below the soil level several times per year. It is encouraged by some agricultural organizations affiliated with the United Nations Food and Agriculture Organization as a way of saving water and reducing methane, another major greenhouse gas emitted by rice paddies. It remains unclear how many farmers do it. “When the soils are frequently wetted and dried, they repeatedly become ideal environments for microbes that produce nitrous oxide,” explained lead author Kritee Kritee, senior scientist at the EDF. “Methane on the other hand is produced by microbes that require soils to be submerged in water,” she told AFP in an email. It is widely assumed that “almost all irrigated farms in the world are continuously flooded and it is a fact that continuously flooded farms do not produce significant amounts of nitrous oxide,” she added. But it is not true that all farms are continuously flooded. Currently, the amount of unaccounted-for N2O global emissions from rice may be as high as the annual climate pollution from about 200 coal power plants, according to the authors. In India alone, where the study took place across five intermittently flooded rice fields, nitrous oxide emissions “could be 30–45 times higher than reported under continuous flooding,” researchers estimated. Overall, they calculated that nitrous oxide per hectare (2.5 acres) was three times higher than ever reported by research on intermittently flooded farms before. “When this new information is extrapolated across the world and embedded into estimates of methane emissions, the net climate impact from both methane and nitrous oxide could be two times higher than previous estimates,” Kritee said. 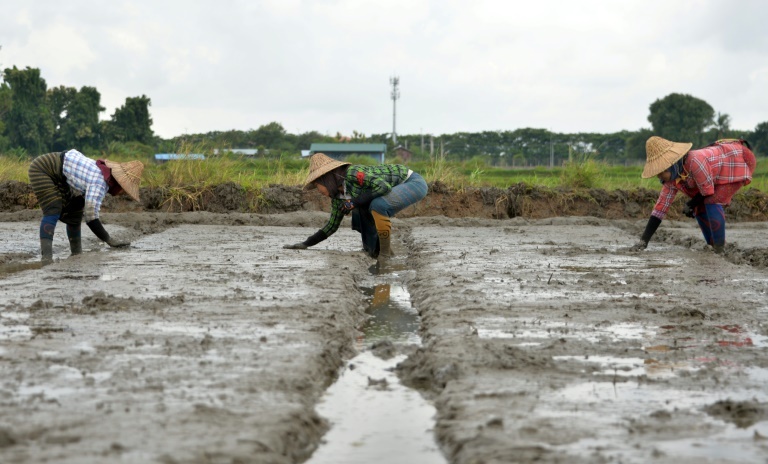 Experts say a better way would be for all irrigated rice farmers to shallowly flood their fields, meaning the water level stays within five to seven centimeters of the soil level. “This flooding regime produces the least amount of methane and nitrous oxide,” Kritee said. As of now, N2O from rice-growing simply isn’t being tracked on a broad scale, and is left out of greenhouse gas inventories reported to the United Nations by major rice-producing countries including China and India. But as water becomes scarcer around the globe, many rice farmers may look to wet and dry cycles as a solution, not knowing the danger they are posing to the planet.